Tim Duncan was a man of few words on and off the court. Instead, the former San Antonio Spurs star power forward always spoke loudly with his stellar game. 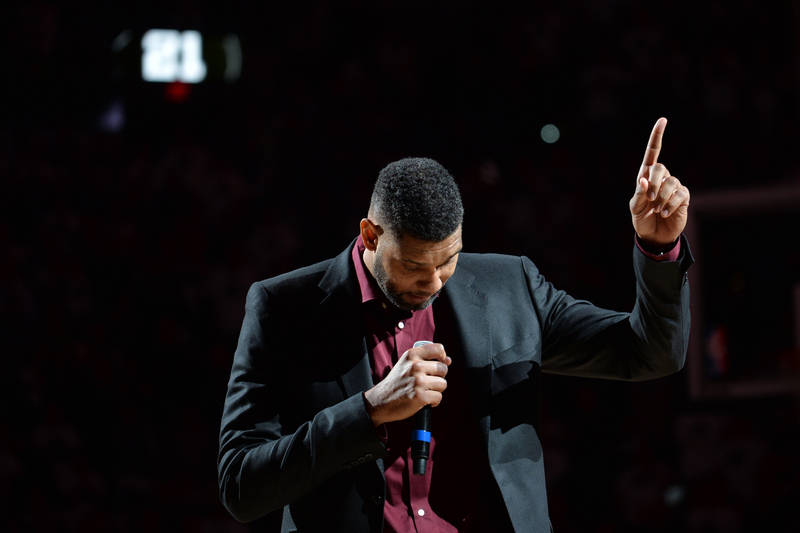 On Sunday night, however, Duncan will be forced to leave his comfort zone and deliver a speech in front of a sold-out crowd as his jersey is retired and raised to the rafters. “I just think he wants to get it over with because he knew it was coming at some point,” Spurs coach Gregg Popovich told The Undefeated. “The sooner, the better. The quicker, the better. He probably won’t say much. He probably wishes we wouldn’t do it. Duncan’s No. 21 jersey will be the eighth Spurs jersey to be retired when his former team faces the New Orleans Pelicans. Duncan joins an elite Spurs retired jersey club that includes David Robinson (50), George Gervin (44), James Silas (13), Johnny Moore (00), Sean Elliott (32), Avery Johnson (6) and Bruce Bowen (12). And while each of those players were standouts in their own right, it’s safe to say Duncan was the best to wear the silver and black. NBA Legend Tim Duncan is honored at his jersey retirement ceremony on December 18, 2016 at the AT&T Center in San Antonio, Texas. The Spurs announced Duncan’s retirement after 19 seasons on July 11. The 7-foot, 260-pounder is the franchise’s all-time leader in points (26,496), rebounds (15,091), blocked shots (3,020), minutes (47,368) and games played (1,392) while ranking third in assists. The two-time league MVP is fifth all-time in double-doubles (841) and blocks, sixth in rebounding and 14th in scoring in NBA history. He also won five NBA championships while playing his entire career with the Spurs. Arguably the greatest power forward in NBA history, Duncan is easily guaranteed a spot in the Naismith Memorial Basketball Hall of Fame when he is eligible in 2021. Spurs guard Manu Ginobili said Duncan’s jersey retirement will be “emotional” for him. “A lot of flashbacks will come back to me because of what we went through. Most of his games were with me,” Ginobili said. Duncan has been at several Spurs practices this season, and worked out on the court with newcomer forward/center Pau Gasol on Monday. But considering the knee pain “The Big Fundamental” endured during his career, no major miracle return is expected. During his final NBA season last year, at age 39, Duncan averaged career-lows of 8.6 points and 7.3 rebounds and struggled in the postseason. Ginobili was surprised that Duncan continued to play as long as he did. San Antonio Spurs’ Tim Duncan listens while special guests speak about him during his jersey retirement ceremony, Sunday, Dec. 18, 2016, in San Antonio. Popovich said that Duncan considered continuing to play, but wasn’t interested in “collecting a paycheck” since his knees were in “bad shape” and he was ready to spend time with his son and daughter. But if he somehow starts feeling much better, Ginobili is ready to welcome him back. “If he ever wants to be back, we will bring [the jersey] down and he can wear it again,” Ginobili said. Ginobili said he misses Duncan’s calming presence with the Spurs, especially after losses. He said he’ll miss his dry sense of humor, the respect his teammates gave him and his big plays down the stretch, too. While Parker misses Duncan on the court, their friendship has continued off of it. Popovich has been known for his fiery, straight-no-chaser coaching style through which he treats every player the same. But it’s no secret that no player has meant more to him than Duncan. 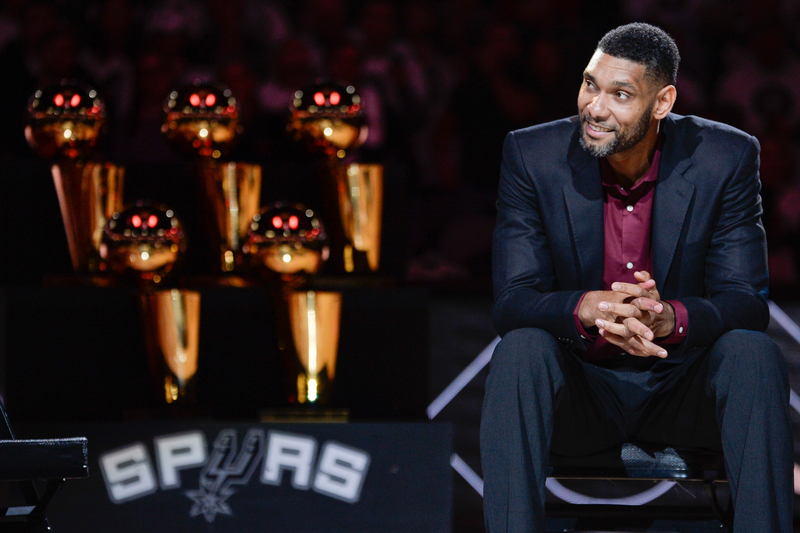 If there was ever a moment where the former Spurs star and his beloved coach were to show a teary side, Duncan’s jersey retirement ceremony could be the night. 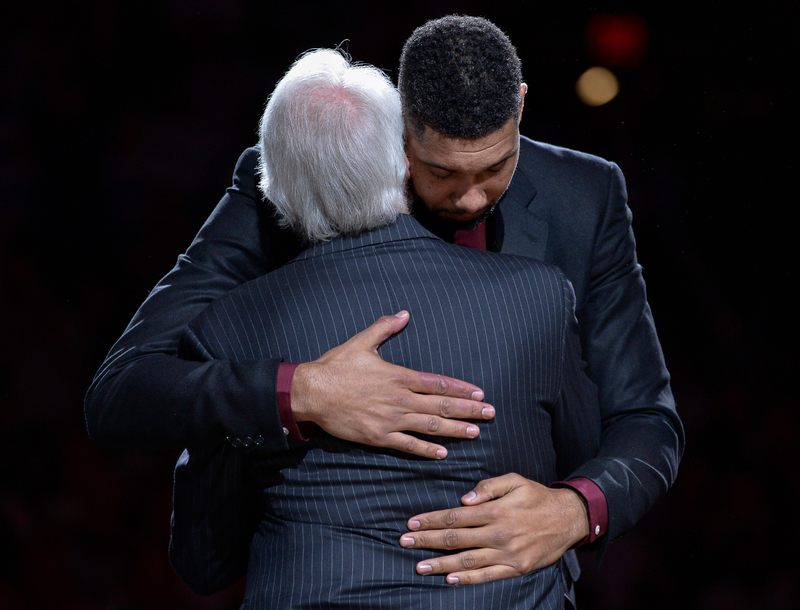 San Antonio Spurs legend Tim Duncan, right, hugs Spurs head coach Gregg Popovich during Duncan’s jersey retirement ceremony, Sunday, Dec. 18, 2016, in San Antonio. “When you’ve been with somebody for 20 years, it’s pretty emotional. It’s already been that way, so hopefully there is none of that left in there. Hopefully, I will be good. Hopefully, I won’t be tearing up,” Popovich said.